I should have had lunch with Leeander today to discuss the 2008 edition of The Interaction Frontiers, the innovation related seminar we co-produce each year. Just a few minutes before our appointment he SMSed me cancelling the lunch. After a while, while at lunch with my boss, I received a call from Leeander where he told me he was in a mess managing the calls after an article on Virtual Assistants (he’s an Interaction Design Director at Kallideas, and they actually produce VAs) on a major Italian magazine. A Virtual Assistant is basically a 3D human-like interface that processes natural language (both spoken and typed) and is ahead of an artificial intelligence engine which takes information from a knowledge base. I’m gaining more and more knowledge on this subject since we’re developing a VA – named Gabi – at Gabetti (see here a video interview with some interaction with the VA, in Italian) , together with the Kallideas team, to manage the basic support at our IT helpdesk. And – since the pilot phase launch early on July 2007 – we started training Gabi. We choose the training arguments by taking a look at the most frequent items on our online helpdesk: we released Gabi with basic knowledge on PC, printers and network problems and then moved to email and password management. During a meeting, early this week, with our Helpdesk manager and the IA expert from Kallideas I was taking a look at the tickets data to understand which arguments need to be teached to Gabi next and then BOOM I “saw” the long tail in these data. 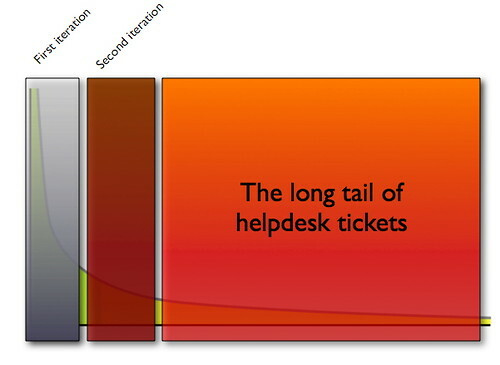 It’s not long ago that I finished reading the inspiring The Long Tail book by Chris Andreson: looking at the ticket statistics I saw how the higher number of tickets was concentrated in less then 10 different arguments and, from there, the number of tickets decreased rapidly while the problems our users were declaring raised impressively. It was pretty interesting finding my first tail, but now problems arise: VA are very good at managing a small amount of know-how helping with this large numbers of users; but we’re now going to face a nice task: managing a large amount of information to help a relatively small number of users… uhm… need to go deeper into this to better understand the most effective solution. This entry was posted in Beef and tagged gabetti, user experience, work by admin. Bookmark the permalink.